June is National Safety Month – Want to Talk About it? National Safety Month focuses on improving our safety on the road and in our homes and communities. Have you considered how talking or texting on your cell phone during exercise could affect your safety – and overall fitness? First, let’s look at safety. You have probably had it happen. You have been talking or texting on your cell phone while you were upright and moving. Suddenly you stumble or find yourself on the ground because you fell. Of the two, texting has the greatest impact on your balance. If you think about it, when you are looking at your phone screen you will not notice changes to the walking surface or how your body is moving. Texting reduces your stability by 45%. While talking on a cell phone reduces your stability by 19%, both makes it more likely that you will fall and injure yourself. So how does talking or texting during exercise affect your overall fitness? Have you noticed or considered that using a cell phone while exercising lowers the intensity of your exercise session? You move slower, put in less effort and can see fewer benefits over the long run. So if your time is limited, and you want to get the most out of each minute spent exercising, maybe you can leave the texting and talking until after the shower. Let me leave you with some good news for your cell phone. It is fine to use it to listen to music while you are working out. When you use it for this function, it does not affect balance. Also, when you listen to music it helps you enjoy and keep up the tempo of the workout. However, keep the volume low and never wear headphones if they will keep you from hearing oncoming dangers in your environment. To learn more about our fitness programs at Dedham Health, visit our website. Mind to muscle connection is the ability to consciously recruit and activate a given muscle or muscle group. When working in the gym, a strong mind to muscle connection can be the difference between achieving an effective, intentional muscular contraction and simply moving weights up and down. Any time I am performing an exercise, I make sure I know why I’m doing it, and I make sure I am feeling what I want to feel. For instance, if I am doing a triceps press down, I make sure I can feel the triceps at the back of the upper contract with every rep. It’s easy just to throw on some heavyweight and move it only to feel the shoulders, chest, and elbows during the movement and nothing in the actual meat of the triceps. But if the point of the exercise is to train the triceps muscles, then you gotta make sure you feel it in the triceps! So, how can you maximize your mind to muscle connection? First – know your basic anatomy. If you’re going to take the time to go to the gym multiple times per week, then you at least want to know your basic muscle groups. Even as a gym novice, you should at least take the time to learn where to find the pecs, lats, traps, deltoids, biceps, triceps, abs, low back, glutes, quads, hamstrings, and calves. These are just a few general muscle groups, but knowing where they are in the body is a great place to start. This way, when you are training these muscle groups, you will at least know where you should feel your muscle activation. Second – Lighten the load. How often do you see dudes in the gym heaving around super heavyweight just because they think it has to be heavy and feel challenging to be effective? While you do need to challenge your muscles, you have to do so intelligently. Make sure you’re actually challenging the muscle you intend to train. Sometimes that means you have to lighten the load in order to properly move the weight and contract the muscles you want to be involved. So, if you’re swinging up some heavy biceps curls, and all you can feel is your lower back cheating up the weight, then try lowering the weight and be more mindful of feeling the biceps actually doing the work. Third – Slow things down. You took the time to go to the gym, might as well get the most out of it. I know, I know, sometimes being at the gym isn’t your favorite thing in the world, but simply flying machine to machine and just trying to get it done is more of a waste of time than anything (and also a good way to get hurt). Before you perform an exercise, take the time to think about what muscles you are going to be targeting and control the movement and actually try to feel those muscles. Slowing down the pace will let you really focus on the contraction of the muscles and over time, you will create a stronger and stronger mind to muscle connection. Fourth – Mobility work. Full range of motion and stretching. We know that fully stretched muscle fibers have a greater potential for activation. Going through full ranges of motion around a joint will give your muscles better potential for contracting and give you a better chance to feel it. Also, tight muscles can inhibit contraction and activation. There is something called reciprocal inhibition. Basically, muscles perform certain actions and then there are muscles that perform the OPPOSITE action. They are called “agonist/antagonist” muscle groups. If a certain muscle’s antagonist is tight, it may make it difficult to recruit and contract. So…. Tight biceps (agonist) may make it difficult to contract and feel your triceps (antagonist) for instance. So make sure you stretch, stretch, stretch all of your muscles (even the small ones) and use a full range of motion! Foam Rolling – Is it for You? If you’ve been into a gym or a sporting goods store, you’ve likely seen a foam roller, and possibly wondered about its purpose. Foam rolling can actually be as effective as a pre-workout warm-up to loosen up the muscles, as well as a post-exercise active recovery. The pressure applied during foam rolling can help increase blood flow and alleviate tightness in the involved tissue. 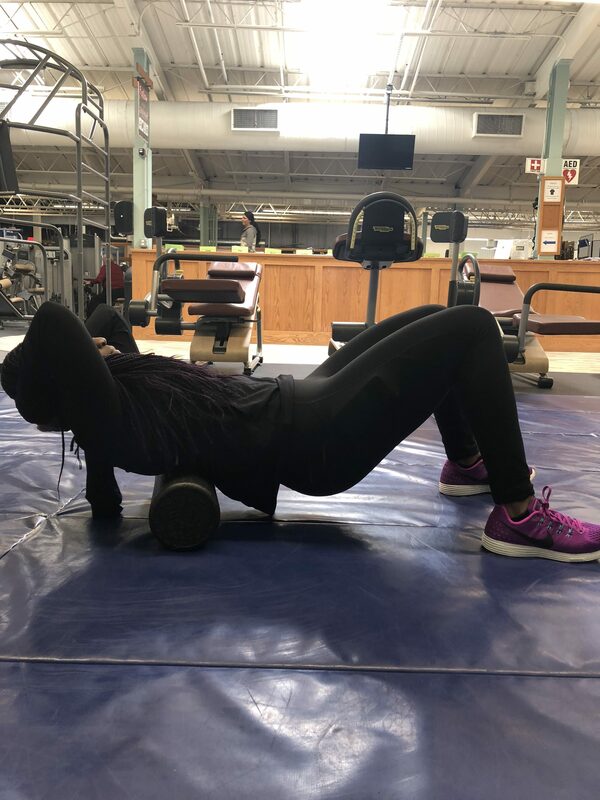 Use of a foam roller helps to loosen the muscles and increase range of motion (ROM) and flexibility, which can be particularly important prior to a challenging workout. The improved blood flow and ROM gained from foam rolling also means being able to move more safely and effectively during exercise, reducing the risk of injury from improper movement. Post-exercise, muscles can become sore due to the buildup of waste products, and foam rolling is an effective means to draw fresh, nutrient-rich blood to those tissues to promote faster recovery. Foam rollers generally provide the greatest response when placing a body-part directly on top of the roller and moving rhythmically to apply pressure to the underlying tissues – take the time to slowly roll through any knots or areas of tightness. This is strictly a soft tissue exercise: be sure to avoid rolling over any bones or joints. Be careful to distinguish between DOMS and an impending injury, which will tend to linger and be sharper in nature. Feel free to visit our website, here to learn more about fitness programs at Dedham Health or tour our fitness center and get to rolling! It’s Only A Few Pounds – What Does It Matter? Most people have had it happen. They see the scale go up a few pounds after the Holidays. Or they only see a few pounds come off after weeks of trying to lose weight. It can’t really be that bad or good – can it? You may be surprised by our findings! First, what about gaining a few pounds? By itself, this may not be that harmful. And if you address it immediately, they can come back off or you can keep yourself from gaining more. However, if you have been gaining a few pounds year after year after year, it does add up. Being overweight (weighing 20% over ideal weight) places people at higher risk for heart disease, type 2 diabetes, sleep apnea, gout, arthritis and certain types of cancer. In addition, carrying around extra weight can be harmful to joints and bones. All of this can lead to lower quality of life and depression. Talk about depressing. Okay, so far this is not such good news. So, what can a few pounds of weight loss do for someone who is overweight? More than you probably think! Let’s start with the knees. Each pound of weight loss equals a 4 pound reduction in joint stress per step. Over a mile, this would reduce the load by 4800 pounds. And when you have lost 10 pounds this would equal a 48,000 pound reduction over the same mile. Isn’t that the bees’ knees! Let’s up the ante to 6 pounds. This amount of weight loss has been shown to decrease chronic inflammation in the body. It can also increase your HDL (good) cholesterol by 1 point. Inflammation and low HDL levels have been linked to vascular diseases. Less inflammation and improved HDL levels could mean less disease. This is when less is really more! What happens when you reach 10 pounds of weight loss? This is closer to what is recommended for better overall health. 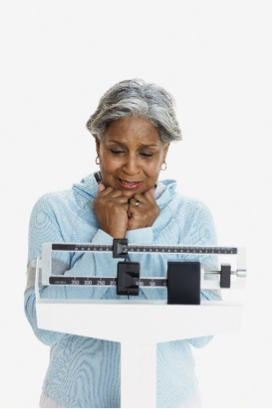 When 5 – 10% of weight is lost, blood pressure readings can drop by 3 – 5 points, you will sleep better, your risk of developing breast cancer or having a heart attack is cut by 50%, and you can add up to 10 years to your life. Now that is something to bang the drum about! For more information on our weight loss programs at Dedham Health, visit or website or give us a call at 781-326-2900!